This weekend I sat eating my lunch in peace, watching Battlestar Galactica, when all of a sudden I hear this rustling to my right. I ignore it thinking it is the open window blowing a brown bag sitting on the floor. But the rustling continues. The noise is starting to get distracting and annoying, so I reach down and move the bag out of the way of the window. A moment later the rustling continues. In the same spot. I pause for a moment, thinking to myself, "Am I going crazy? Have I finally lost it for real? 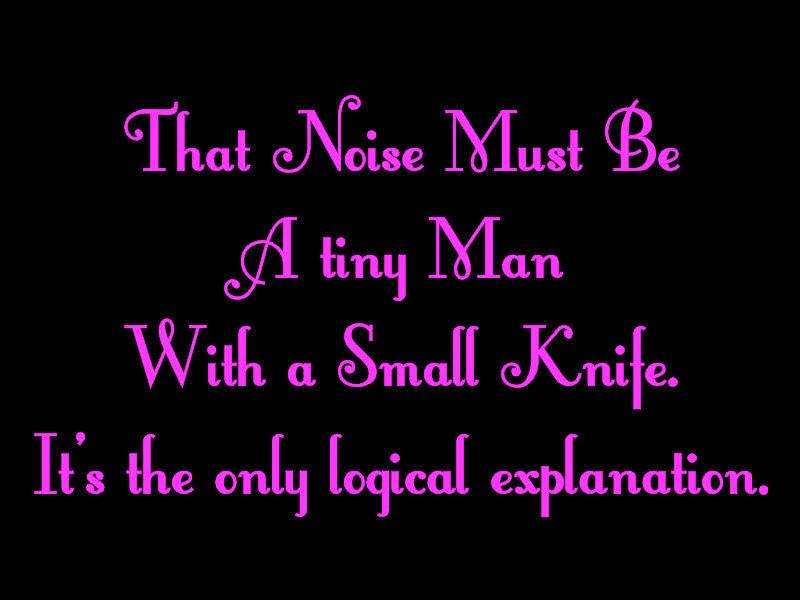 Or is could it be a tiny man (I'm thinking Borrowers small) with a small knife rooting through all of the junk Mona has on the floor to rob us and, if he knows I know he's here, possibly murder me as well?" I slowly move my head, as not to alert the tiny man of my presence, and look down at the source of the noise. I did not see a tiny man, but I did see an open popcorn bag, that I'd left there the night before (Yes, sometimes I leave open popcorn bags on the floor. I'm lazy and forgetful...don't judge me). The bag was moving, but there was no wind. First, I let out a sigh of relief that it wasn't a tiny man trying to murder me. Then I took this picture. Because that's what you are suppose to do when you find something disgusting or if someone falls or if a baby's crying. At least that's what I've learned from social media. Plus, if you don't have proof, it never happened. After my evidence was gathered I stared at Pop, short for Popcorn of course, and tried to figure out how I was going to grab the bag and close it without him jumping out onto my hand and to bite me and giving me death and disease for interrupting his lunch, because that's what I would do if someone interrupted my lunch. At least, if I died from a mouse bite, my picture would point my family and the police to my killer. I am happy to say that I figured out a way to avoid getting bit! The answer...let him escape. Yup, as I sat trying to figure out a way to maneuver to grab the bag for so long that he jumped right out and ran away. I just watched him go. He ran across the room and under Mona's bed (which if she asks did not happen). I knew there was no way I would be able to catch a mouse bare handed, so I just went back to eating my food and watching Battlestar Galactica. 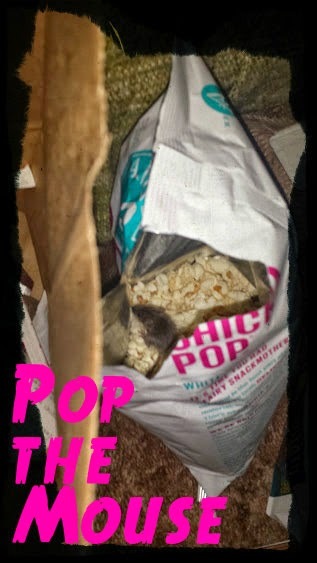 I was upset that there was a mouse in my house and that he escaped, but I was more upset that he ate my popcorn! I sent Mona the picture of Pop and told her to pick up some live mouse traps on her way home, but she brought home death traps! I protested and said I couldn't kill Pop, but she insisted they were the only traps available and I would be using them. Until the mouse is caught, Mona is not sleeping in our bedroom...she is sleeping downstairs in a recliner. I don't have the heart to tell her a mouse has feet. Everyday she asks if I caught the mouse and I crinkle up my face and say, "yes?" in a high pitched voice. She must not believe me, because she is still sleeping downstairs. Part of me is relieved that Pop hasn't gone into one of the death traps. I hope he escaped outside to live out the rest of his life in peace.